Primeira vez em Melbourne? Veja a cidade de todos os ângulos ao combinar uma excursão abrangente à capital cultural da Austrália com um cruzeiro panorâmico pelo rio Yarra. Navegue por pontos de referência à beira-mar, como o Aquário de Melbourne, o Crown Casino e o Southbank, depois faça um tour de ônibus, passando por locais famosos como o Melbourne Cricket Ground (MCG), o Melbourne Park e o Etihad Stadium. Salte ao longo do caminho para passear pelo Royal Botanic Gardens, passeie pelas lojas na animada St Kilda ou tire fotos das coloridas barracas de praia de Brighton Beach. 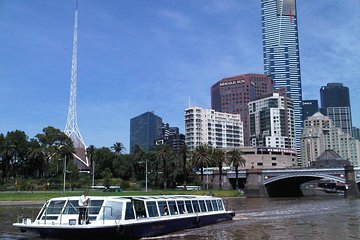 If you have limited time in Melbourne, this is a great tour to see the highlights. As this was our second trip to Sydney, we wanted to spend a weekend in Melbourne. We were able to see the harbor via boat which is the first part of the tour then we were taken around the city by coach. Our driver and guide was Ian and he was fantastic. He seemed to know everything. A true scholar and gentleman. Just FYI, the coach will not pick you up from your hotel but it will drop you off there. Getting to the departure point is very easy and the city tram is free to that area. One final point, we took the train from Sydney to Melbourne. That is a long ride almost 12 hours. Thought it would be fun and bought first class tickets...unfortunately, first class is not what you may be accustomed to experiencing. Left a lot to be desired. Good introduction to the city. Especially liked St. Kilder and Brighten Beach area. Would have enjoyed more time there. Got lost in Garden and was a few minutes late but guide was very patient. Really good trip, I just found some of the walking required a little difficult due to my mobility and age. We were disappointed to see if we'd booked onsite at federation square we could've got '2 for price of 1' for this trip! Dissapointed and feeling ripped off! Bus trip was great with a very good knowledgeable driver. it was a good afternoon out, tour guides were knowledgeable and very friendly. enough stop off times so you had time to explore and relax. A very informative tour both on the ferry and the bus, although the ferry was very tightly packed with no room to eat the lunch supplied. What a wonderful way to start a surprise holiday, the vpriver cruise was brilliant and the guy gave so much info while we meandered down the river, lunch was great, vegaterian option was very tasty. Back on a lovely co for table bus, and Gordon was just a fountain of knowledge, the commentary never stopped and so interesting. I am now a concert to bus trips, as I have always thought they are for old people, but no, go out and do it a any age, you get to see everything for a greater night and learn as you go. Thank you once again Gordon for a truely memorable trip, and also for dropping us back to the hotel in Little La Trobe street.